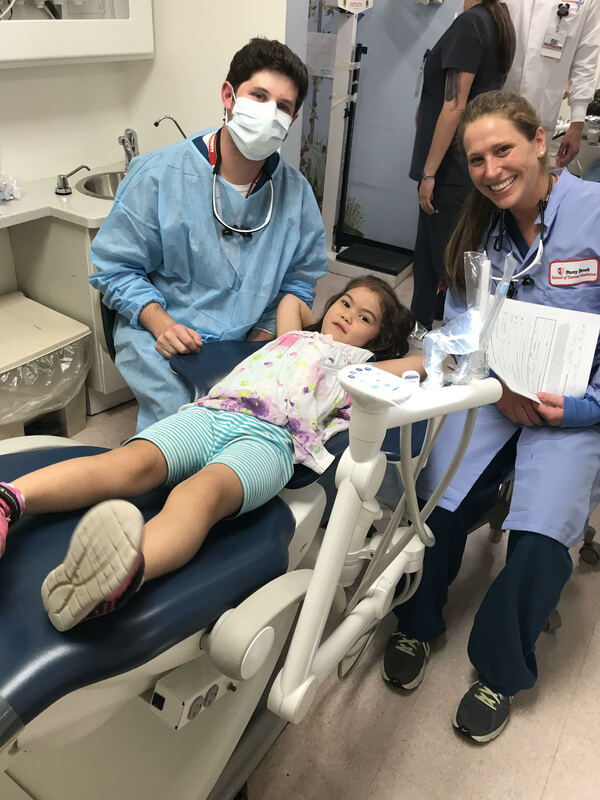 Over 200 kids were treated to free dental care at the Stony Brook School of Dental Medicine’s 11th annual “Give Kids a Smile” event on Aug. 28. Underserved children ages 1 to 17 were given free dental screenings, cleanings, fluoride treatment, oral health education and an Island Federal Credit Union backpack filled with crayons and pencils just in time for back to school. At the end of the exam, each child was given the option to become a patient at the school where they can receive care from a dental student as well as a full-time dentist. “Many parents can’t afford their checkup, also they may need it, some districts are now requiring a checkup before going back to school, just like they require you have a medical physical,” Mary R. Truhlar, dean of the School of Dental Medicine, said. During the four-hour event, pediatric residents worked with 3rd year dental students to treat the patients. Dental student Parandis Nejati said she was thankful for the hands-on experience this event has brought as well as the opportunity to give back to the community. “There’s so many disadvantaged populations right here on Long Island, which is surprising to a lot of people. The event is really about giving back to the children,” Nejati said. The “Give Kids a Smile” program was created in 2002 by two dentists in Missouri. By 2003, the American Dental Association made it a nationwide program. Give Kids a Smile officially begins the first Friday of February to coincide with national “Give Kids a Smile Day,” and continues nationwide throughout the year as schools and dental organizations hold their own events. The School of Dental Medicine has been hosting “Give Kids a Smile” events since 2002. With a growing number of patients, the event in February was moved from the dental school clinic to the Cradle of Aviation Museum in Garden City, where Stony Brook students work with Long Island dentists to treat children to free oral health care. In 2007, the School of Dental Medicine began hosting a “Back to School” event as well. Truhlar believes the event was a natural addition to the school’s community outreach programs. Jill Gomez, a mother of two, Kyle Gomez and Tyler Gomez, brought her kids in for the free exam and was surprised by how nice and well-organized the program was. Kyle Gomez, 12 years old, was just happy they weren’t pulling on his teeth. “I liked them more than my regular dentist, they were better,” he said. His 11-year-old brother, Tyler, agreed. “We were really nervous to come in, but it was better than the ortho,” Tyler Gomez added. Annually, the school treats 70,000 patients according to Truhlar, many of whom don’t have healthcare. A previous version of this story misspelled Parandis Nejati’s last name.